Off with their heads! 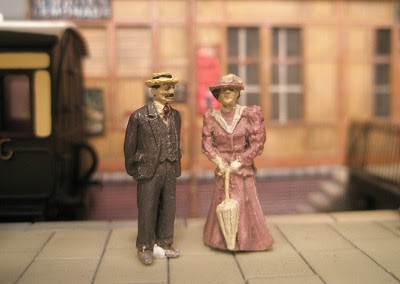 Farthing is set in Edwardian times, but good figures from this period are not easy to come by. 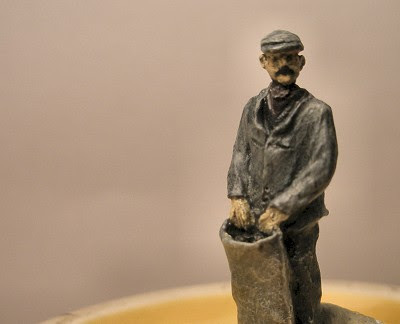 I've therefore been doing a bit of backdating to the excellent Monty's range of 1930s-50s figures from Dart Castings. 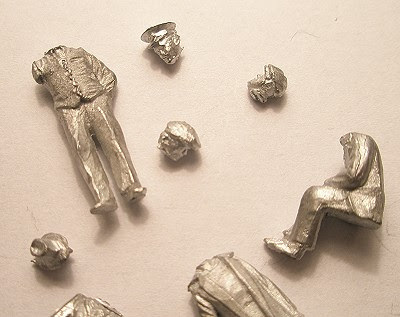 The photo above shows a rather gruesome selection of body parts left behind from butchering and modifying the Monty's figures. This lunar landscape shows my preference for blu-tacking the figures to inverted cups, so I don't have to handle them during painting. 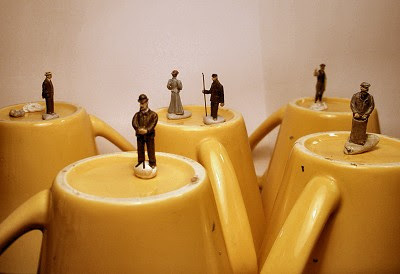 The cups give a good grip and you can turn them any way you want to get the right angle for painting. Paint and varnish is Vallejo acrylics, which are superb and work fine for me on whitemetal as long as its primed and varnished. Mr and Mrs Longbottom in trial position on the bay platform. They will shortly be joined by Mrs Longbottom's niece, who is slightly delayed due to her currently having no head. 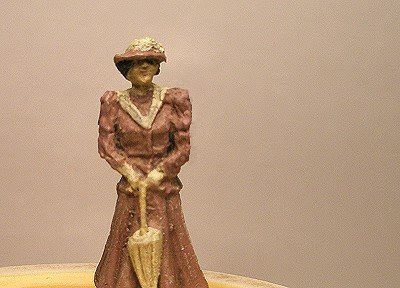 Mrs Longbottom is the result of a bit of fun figure-bashing (terrible word!). 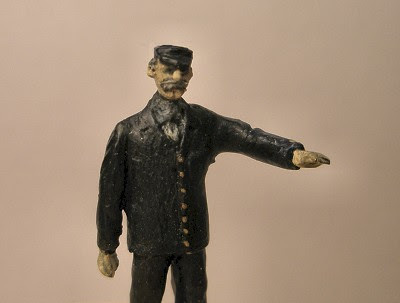 The face and upper body is from a Monty's figure (this one), with a bit of DAS modeling clay added to the hat and body to suit the style of the period. The lower body is from the Langley range of Edwardian figures, whose dresses are rather good, but whose upper bodies are a bit too stick-like for my tastes. Adding various types of beards to the figures (well the male ones at least!) helps to backdate them. 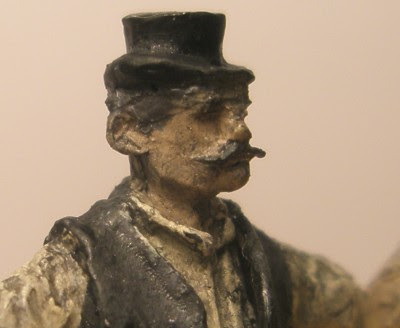 This ganger is remodelled from a Monty's figure, adding a moustache made from Miliput, and with a modified hat. The latter was inspired by a similar hat worn by a ganger in a photo I have. None of your fancy bowlers here! This was originally a 1930s porter that I've attempted to backdate by filing off his pockets, modifying his cap and adding a moustache. His arm has been repositioned as he will be standing by a cart. This gentleman has had his original hat replaced with a bowler made from bits found in the spares box. This seems to be one of the more popular figures from Monty's. 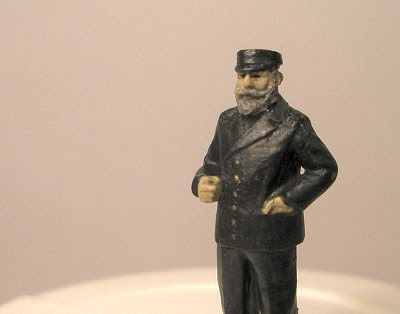 I've filed down his hat to represent the boaters of the period, and modified his nose just a little to make him look different from all the other ones out there. 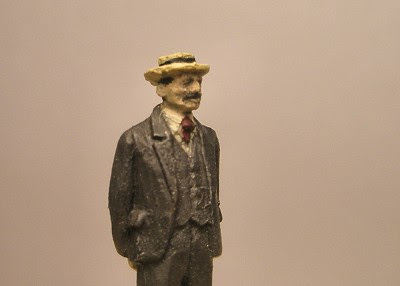 This worker is entirely unmodified, with the moustache painted on. I go for relaxed poses when I select figures, as I'm no great fan of the "frozen movement". Hmmmm, went a bit too far on the backdating there! 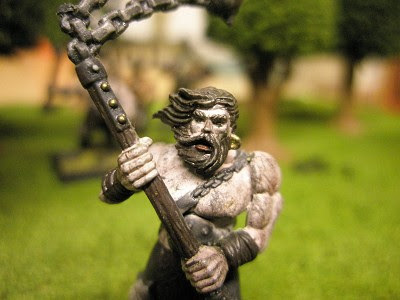 Jokes aside, this is one of my son's plastic Warhammer figures that I painted. Now I know they're a bit larger than 4mm figures (I don't believe there's an exact scale for Warhammer - for good reason! ), but they're not that much larger, and look at all that crisp detail. 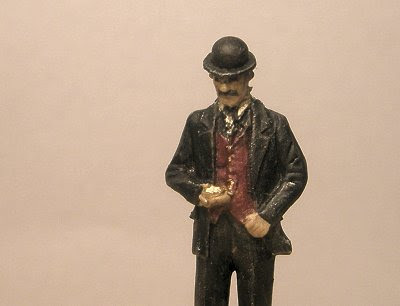 Imagine those production techniques applied to 4mm model railway figures! But I suppose the cost would be too high and the market too small?